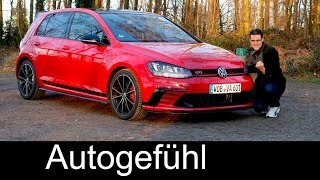 To celebrate the 40th birthday of sporty compact Golf GTI, Volkswagen decided to pull of curtains from its power drenched and beauty dipped Volkswagen Golf GTI Clubsport 2016. However this isn’t the only anniversary model from the house of company, prior to this they also unveiled other models to celebrate their anniversary. 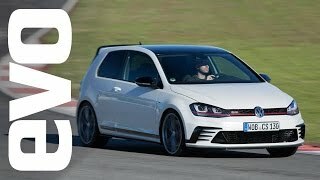 Let us have a look at the review of Volkswagen Golf GTI Clubsport 2016 to know what they have in their magic box this time. The interior of Volkswagen Golf GTI Clubsport 2016 like always will keep you mesmerized. Starting with the sitting, you’ll have tartan fabric upholstered sports seats, getting contrast through red stitching. A distinct shifter knob in the shape of golf ball and a black headliner also add to the glory of interior. The racing sports seats can be folded. Entire interior keeps the race-spec features and will make you feel the touch of some supercar instead of a sporty hatchback. Looking ahead when you’ll be opening the front doors, you’ll find a distinct stainless steel kick plate with red GTI lettering on both the sides and thus making your experience more special. In all the interior of Volkswagen Golf GTI Clubsport 2016 is sportive, luxurious and comfortable. The exterior of Volkswagen Golf GTI Clubsport 2016 come dipped in ‘Oryx White’ while the roof comes painted in black. Up front you’ll notice a redesigned bumper. Moving through the side changes can be more noticed, first in the list is the black trim stripe running between the front and rear wheel arches. On top of the model you’ll have multi-part roof spoiler while the body rolls over all new forged 19” optional and 18” standard aluminum-alloy wheels. The black trim stripe we talked about continues to mark its presence in the front as well. It can be notice running through the air vents along front bumper. In all the exterior of Volkswagen Golf GTI Clubsport 2016 holds numerous qualities that make it stand apart from the line-up. Beneath the hood of Volkswagen Golf GTI Clubsport 2016 sits a 2.0 Liter four-cylinder turbocharged engine delivering total output of 261 hp. However the story doesn’t just ends here, with its new boost function a hit over the throttle pedal can boost the power output to whooping 286 hp. 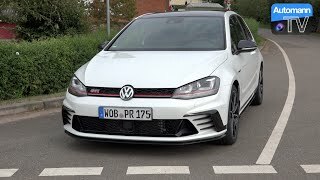 With this power rolling it wheels, top speed of Volkswagen Golf GTI Clubsport 2016 touches the mark of 155 mph while the 0-62 mph sprint can be knocked in 6.0 seconds when equipped with six-speed manual transmission and in 5.9 seconds with six-speed dual clutch automatic transmission.